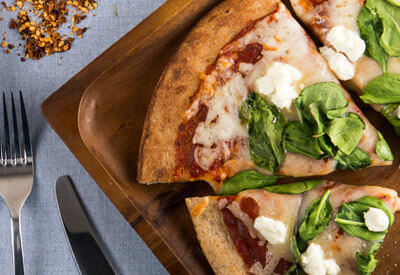 Homemade pizza is a quick family favorite you can feel good about serving. Choose fiber-rich whole wheat crust and top it with hearty greens like Earthbound Farm Organic Power Greens, Kale, Baby Spinach or Baby Arugula. Then double your veggies by serving the pizza with a simple green side salad -- delicious! Preheat the oven according to the pizza crust manufacturer's directions. Spread sauce evenly over the pizza crust, leaving a 1/2- inch border. Sprinkle pizza with mozzarella cheese. Top with Power Greens (or whichever greens you choose) and crumbled goat cheese. Bake until the crust is golden and the cheese is bubbly, 12 to 15 minutes. While the pizza bakes, toss the rest of the hearty Earthbound Farm Organic greens together with your favorite ingredients to make a salad. Slice and serve the pizza with salad on the side.